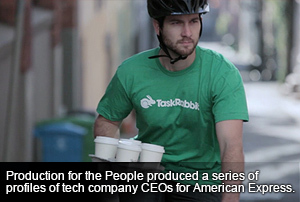 Brand integration has come a long way since those glaring Coke cups on "American Idol." While various forms of brand integration in programming goes all the way back to the early days of TV in the US, the genre burst onto the marketing scene big time with the high-profile series of short films shot by big name Hollywood directors that all just happened to include a different BMW model in the storyline. Produced in 2001, the BMW Films series still gets cited as a breakthrough entry in the category, but much has changed since then. 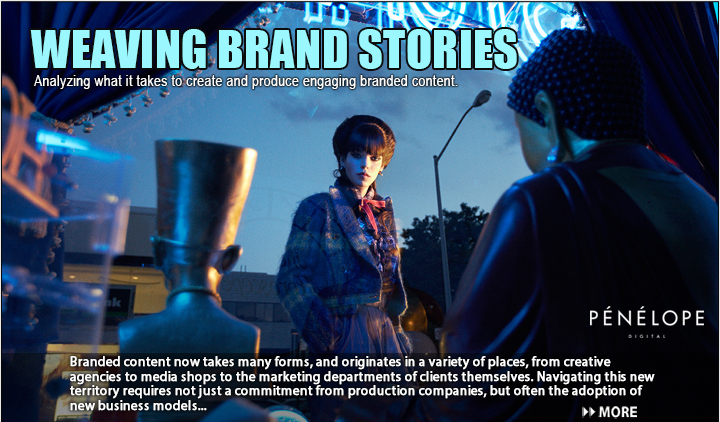 For example, branded content now goes by many names, the most recent iteration being 'native content.' It's just as easily being originated today by media buying and planning agencies rather than creative agencies, or by clients themselves, working closely with talent agencies, online publishers, broadcast or cable networks or digital video multichannel networks. All of this has turned an already diverse and at times confusing landscape for production and content creation into one that's even more complex and challenging. Working in this space bears little resemblance to making traditional TV commercials, aside from the actual production process itself. Companies typically need to work leaner, provide more deliverables, bring their own creative and strategic talent to the assignment and find a way to package both production and post and, increasingly, find ways to help the brand get the content out into a jumbled media space. This need to move into digital distribution and media, for many of these shops, puts them in entirely new territory. Several of her predictions are already being actively considered by some of the sponsor companies we turned to for a look at the latest trends in the branded content space, such as partnering with social media stars for branded content projects. Our lead sponsor for this "Weaving Brand Stories" report is Penelope, the just-launched branded content studio founded by Director Chad Ostrom and Grand Large EP Steve Horton, which offers clients access to a collective of over a dozen creative directors and partner companies, in addition to an expansive directorial roster. 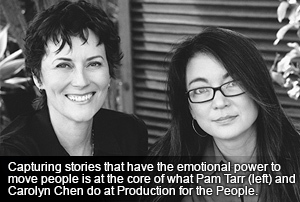 Also on tap for our feature are Production for the People (PFTP), the L.A.-based content creation company founded by Director Carolyn Chen and Executive Producer Pam Tarr that specializes in documentary-style, emotional storytelling; Big Block, the L.A. and New York-based media company led by President Scott Benson and Managing Director Kenny Solomon with roots in automotive visual effects that has expanded into live action, entertainment and new media and is in the process of building out its own digital network; and New York-based First Wave, home to branded content directors Michael Sugarman, Michael Addis and Rik Cordero and led by Executive Producer Justin Havlik. The branded content work these companies have collectively produced represents a cross-section of the category: it runs the gamut from comedy and documentary to real-people, action sports, narrative, product demonstration, you name it. Penelope, for example, was tapped by Wendy's to shoot a Fellini-esque film in Italy as a way to promote a new menu item (an Italian Ciabatta sandwich, of course). The film, written to come off like a spy caper, ran nine minutes long and was shot in Italian with subtitles, to give it that foreign film feel, and was released in three parts on Facebook. And the best part, says Ostrom, who directed, was that viewers were invited to write their own subtitles for the dialogue, which resulted in some hilarious mash-ups and boosted the project's social media standing. PFTP's recent work includes interview series with innovative business leaders produced for Virgin Atlantic and American Express, both of which appeared on the Fast Company web site. They also produced an expansive series of films capturing elements of bar culture for Tanqueray and Mother, New York. Carolyn Chen, who directed, says the series represented an example of leveraging influencers for the brand, with musicians, artists and mixologists part of the narrative. "And the interview format took a departure from the normal talking heads," she notes. "Instead of the typical speaking to someone off camera, the influencers held intimate late night conversations with bartenders." Big Block's branded content work includes an impressive piece of high-speed filmmaking for Nissan's "Meet the Machine" web experience, created by digital agency Critical Mass as an extension of part of the carmaker's 2015 Super Bowl campaign. Director Paul Trillo's short film for Microsoft, "Living Moments," positions the software company at the nexus of all things cool, while directors Josh + Vince teamed up for a Save the Children PSA that turned the tables on a bevy of fashion models. 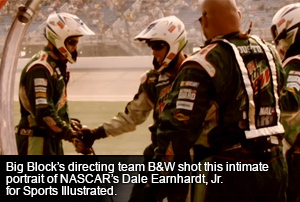 The studio also partnered with The Via Agency on a content-driven Greenpeace campaign titled "#Clickclean" that featured the musician Reggie Watts, and produced a long-format video piece for Sports Illustrated that was the video accompaniment to a behind-the-scenes profile of NASCAR driver Dale Earnhardt, Jr.
At First Wave, a number of directors have been busy with branded content that range from hidden-camera comedy pranks to docu-style and reality-based stories. Director Michael Addis, for example, has worked on two comedy projects, Doritos' "Largest Human Doritos Chip" Super Bowl stunt and Toshiba and Intel's "I Was Framed" prank, which he co-directed with the actor and director Jamie Kennedy. 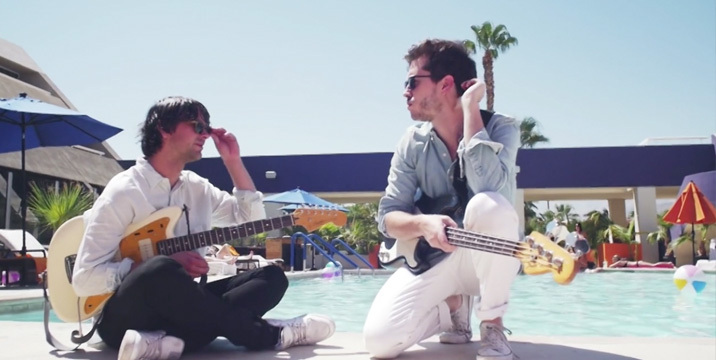 Director Rik Cordero has shot a number of music-based branded content projects, including a documentary following the UK band Cut Copy on their US tour for Levis. He was also asked to cover the US tour of pop duo Nico & Vinz as they promoted their "Am I Wrong" single for the Pepsi Pulse music web site. Havlik explains that on this latter project, the director set out to capture candid moments that reflected the duo's work ethic and inspirational attitude in a way that complemented their lyrics. "Rik crafted a story that introduced Nico & Vinz as the new purveyors of uplifting pop music to American listeners," he says. 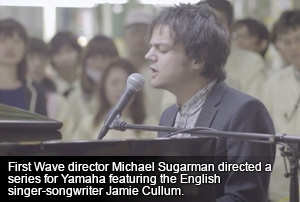 First Wave's Michael Sugarman, known primarily as a comedy director, delved into the documentary world with an ambitious four-video branded content series on the making of Yamaha pianos that features extensive shooting in the Yamaha factory in Japan, interviews with the craftspeople who make the instruments and footage of artist Jamie Cullum and his group in concert there. It's been almost 15 years since BMW Films made the term 'branded content' familiar to ad agencies, clients and production houses throughout the industry. How has the category changed the most since that early and still-iconic piece of brand integration? "There's been enormous change since then," says Penelope's Steve Horton. "They created some snappy short films by huge filmmakers with what was then an up-and-coming platform to play them on." Horton notes that today, branded content is much more widely available than it was in back when Clive Owen was behind the wheel. "It's everywhere, from the web to cable to MCN series to formats that didn't exist then like Twitter, Facebook, Vine and Instagram," he says. "And that's what's made it so much more exciting now – that we have all these media outlets to explore." "They helped establish the potential for what branded entertainment could be," adds Penelope partner Chad Ostrom. "It was ahead of its time and only now that we're really seeing brands embrace non-traditional content as avenues for the creative freedom that BMW films pioneered." If anything, BMW Films made it almost a necessity that progressive advertisers look seriously at how they could utilize the format for their own needs. "It's seen now as a necessity, not a luxury," says PFTP's Pam Tarr, "and it's commanding an increasingly large slice of advertisers' budgets." Reflecting on the limited distribution of the series – just finding a way to watch them was a mission in and of itself – Big Block's Kenny Solomon says the media aspect these days is almost as important as the content. "With the world of content and technology colliding, expertise in mobile, entertainment and media innovation will be a game changer for companies like ours and our clients," he notes. 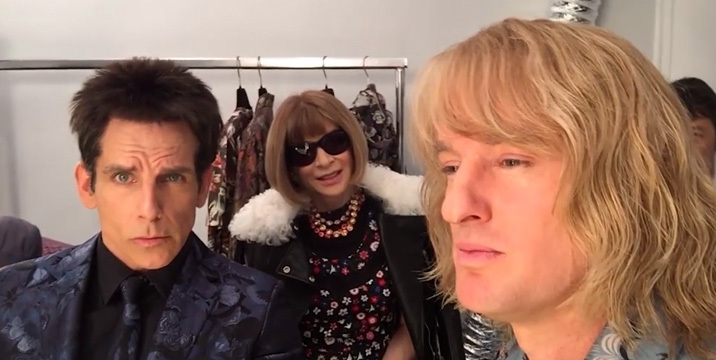 "Video is now marketing's new frontier, be it through YouTube, Instagram, Vine or Snapchat. We have so many more platforms to play video content in an instant." His colleague, EP Corwin Carroll, puts it another way: "As Jonathan Perlman at Buzzfeed says, 'content is king, but distribution is queen.' So when we set out to create branded content today, we have to take both into consideration in order to best position a project for success." While branded content takes many forms, much of it has a reality TV or documentary feel. Will we start to see a wider style of creative approach in this category? "A lot of this is about clients tapping their audience to be a part of the branded experience," explains First Wave's Havlik. "So we see a lot of documentary-style work featuring a person who embodies the brand, or a prank scenario that really elicits a visceral reaction from someone who already has a familiarity or comfort level with a trusted brand." That said, PFTP's Tarr believes that "scripted storytelling is growing and, if it reaches its audience, can be so much more effective by embedding branding in entertainment. A well-crafted story moves people like reality can't; it often comes from a pure, honest place. And that's where we want to be – at that intersection of reality and entertainment." As Penelope's Chad Ostrom points out, "there are more narrative pieces in the branded content space than people realize. This is because when branded content is done well, it shouldn't feel like branded content – it's just, the viewer simply enjoying an engaging story. From the Wes Anderson short film for Prada to a feature narrative one of our head digital creatives did with Kiefer Sutherland, entertainment is always funded by something; whether it's a film studio or a mass-market consumer brand shouldn't matter." The need to create relevant forms of brand storytelling is, if anything, only going to become more critical, says Big Block's Scott Benson. "Younger viewers are deaf to traditional advertising, and traditional TV viewership is falling off rapidly as technology makes it a breeze to skip content (i.e., ads) that are not of interest. To get the attention of this audience, brands need to creatively attach themselves to content in an authentic way. They need to find material that speaks to the needs their product fills and the way their product is used." One element of Big Block's approach has been to create highly-targeted original content that will be distributed digitally, not through traditional broadcast or cable outlets. "Our digital movies provide an excellent avenue for brands to reach a very specific audience," Benson notes. "Prior to releasing our movies, we already know the specific audience that will purchase and view the content. We also know their brand affinities and the types of material that interests them. We can match this with brands that are a natural fit and create a marketing program that goes beyond sponsored brand integration." Using this kind of audience metrics and analytics to guide content decisions, Benson says, allows clients to "own their audience rather than rent an audience, as is the case with traditional media buys." The Directors' Role Diminished? Not likely. In advertising production – unlike in television – the process has historically been director-driven. Where does the director fit into the branded content equation? Is this a marketplace that EPs have to approach with more of a 'studio' offering, or is the strength of a directors' reel and vision still a major imperative? "There's certainly more of a 'team effort' to connect all the dots in the different facets of what can fit into the world of branded content projects," says Horton. "But we really believe a good director will focus the process and help define a point of view. It feels like the production company model has expanded considerably, very much like it has always been in Europe, where the production house is responsible for everything from casting through finishing, SFX, music and titles included. It not only streamlines the creative process, but is also very economical!" Horton says that Penelope has expanded the model by bringing in a group of creative directors to work directly with the company. "Our aim is to bolster, develop and enhance the creative concept," he explains. "We also brought on a digital strategy team that's creating and managing digital activation. And we do this while keeping our director involved in all aspects, which maintains seamless creative continuity." 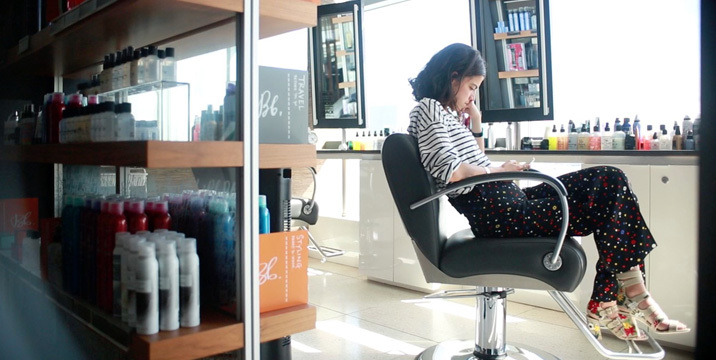 The more open approach to working on branded content projects has its appeal to directors, too. PFTP's Chen has been shooting commercials for over 15 years, and says "I think most directors often feel constrained by the protocols of the traditional TVC. When I speak to creative people about PFTP, they light up and say "YES! "-this is exactly what I could do. Create the concept, shoot, cut, deliver, collaborate. It lets us as filmmakers get back to being invested and not budget constrained. Tarr adds that PFTP has developed a consortium of content creators and creatives "who are multi-talented and can support a variety of projects. So when a project comes to us, we can put together the best team to shape it. When the work comes to our company from an advertiser, it's only about the product and the process; creating the team and the story are often up to us. Certainly ad agencies are more accustomed to creatively collaborating with a director, which we're happy to accommodate." "The bottom line is that we are in the business of entertainment where the studio is only as strong as the creative talent that it nurtures," says Big Block's Solomon. "So yes, the notion of the studio approach driving much of this content is accurate, but only through the sum of its parts." Adds Carroll, "technology has made it easier for directors to become 'generalists,' with strong understandings of all things production, post production, VFX and finishing and some of these directors are functioning in more of a 'studio' effort. This shift is underlined by the new wave of YouTube stars that are using iPhone, 5Ds, GoPros and laptops to create amazing content at home." 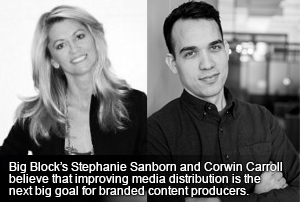 Taking a different perspective is Big Block's Stephanie Sanborn, President of Digital Content. In her view, creative choices surrounding content should take into account the availability of data-driven insights into audience engagement. "In this respect, the whole of the creative needs to match the brand objectives and the audience," she says. "The use of tools like our proprietary technology stack provides immediate access to necessary data, which we surface as meaningful business intelligence to measure results throughout and adjust. What that means is that we're developing content with an eye on interactivity and we're organizing distribution within channels that promote interactivity." Still, once you get in front of the cameras, the vision of those making the content tends to take over, and that seems to be the case in branded content just as in other advertising and media forms. "The director is the integral part of the process, as projects that have a one-line idea instead of a 13-page directors' treatment often feel like they lack heart," says First Wave's Havlik. "They're a blip on the screen, whereas, when done well, a director-driven project creates an experience that is immersive and captivating. And that's what it's all about."